In its proposal, the Foundation described the issues posed by the tower, and offered to bear the cost of dismantling and removing the tower, on the condition that the Foundation would be permitted to take ownership and possession of the dismantled tower upon completion. The Isanti County Board could not immediately approve the Foundation’s request; a legal written agreement for the project, along with the necessary city permits, would need to be in place before a decision could be made. However, the commissioners indicated that if these items were presented at the next board meeting, approval would likely be granted. Other parties present at the meeting offered assistance in meeting these requirements. The Isanti County Sheriff’s Office will be providing the Foundation with examples of past contracts for tower removal, and the County Attorney’s Office agreed to assist the Foundation in preparing the written agreement for Board review. The Foundation is currently working to gather all the necessary approvals and agreements, which will be presented to the Isanti County Board on June 4. If approved, the Foundation will be using two local contractors to perform the dismantling (both of which have agreed to provide the Foundation with reduced rates in support of this community-oriented project). 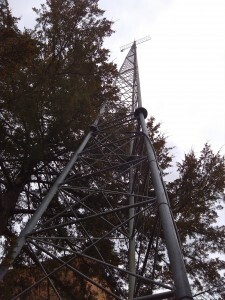 After the teardown is complete, the tower will be refurbished to ensure its safety, refitted for broadcast antennas and other equipment, and erected at a new location – the Foundation’s soon-to-be FM transmission site. The Foundation wishes to extend its gratitude to the Isanti County Commissioners, the County Administrator, and to everyone at the County who has been involved in this process so far. This project truly represents a “win-win situation”, and we look forward to its completion.